Its not WHAT you do but HOW you do it! | Move fast. Think slow. Its not WHAT you do but HOW you do it! As part of my “active recovery” over the past few months I’ve regularly been joining upwards of 40 other people in a room heated to 105 degrees farenheit (40 degrees C) for 90 minutes of, as the teacher calls it, “eyes wide open meditation”, otherwise known as Bikram Yoga. Most of my athletic life has involved pushing my body’s limits and pounding my muscles in the pursuit of longer, faster, stronger. 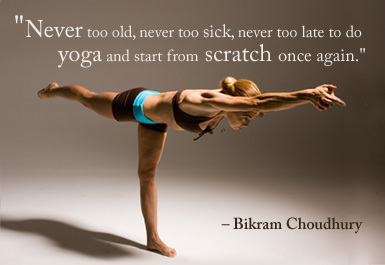 Bikram yoga feels like the opposite of competition. It is all about and for you, comparing how deep you can go with others is completely irrelevant. It is a chance to rejuvenate the physical body while growing mental focus and stamina at the same time. As sweat runs off my body like a waterfall, thoughts of “I’m SO HOT!” and “Am I going to make it through this?” are common in this practice and if I don’t bring myself right back to the here and now it will be a struggle to get through….let any thoughts just pass through your mind and drift away…. And so I have been reminded of this: you can practice the same things over and over, such as the same 26 postures and 2 breathing exercises done in every Bikram yoga class, but HOW you do it will determine what you get out of it in the end and over time. If you enter a room of 40 degrees and view it as 90 minutes of torture and wish your were somewhere else the entire time you won’t be present, balanced (literally), focused and mindful of what you’re doing. We can go through the motions in life or practice being more mindful and present in everything we do. We live in a culture that praises the ability to multitask. As moms we sometimes think we can do it all – make dinner, answer emails, and be tuned in to our kids needs all at the same time. Personally, these moments don’t work out too well for anyone in my experience. Just as workouts and races turn out much better when I’m fully present and focused only on the present task I need to be doing. We often forget the simplest sounding things sometimes take the most practice such as remembering to breathe deeply, just do one thing at a time and do it well! This entry was posted in Sport Psychology and tagged sport psychology by Danelle Kabush. Bookmark the permalink. Hot yoga is my most favorite place to focus on me.